There are 12 publications for European Union (EU). While a consensus has formed that the eurozone’s economic governance mechanisms must be reformed, and some progress has been made on this front, what has been agreed to so far falls short of what is needed to address the central imbalances caused by the eurozone setup, according to Paolo Savona. 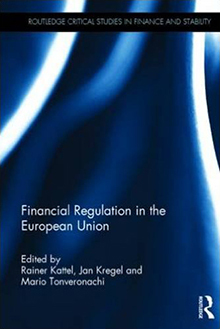 The key elements that are missing from the current package of reforms are interrelated: a common insurance scheme for bank deposits, the possible regulation of banks’ sovereign exposure, and the existence of a common safe asset. Savona outlines a proposal to increase the supply of safe assets provided by a common European issuer (the European Stability Mechanism) and explains how the plan could be made economically and politically satisfactory to all member states while facilitating progress on the deposit insurance and sovereign exposure issues. By Jan A. Kregel. Edited by Rainer Kattel. Foreword by G. C. Harcourt. The flaws of the Maastrict Treaty are a frequent object of commentary but, as yet, Europe remains unable—or, perhaps more accurately, unwilling—to address these flaws. The European project will remain unfinished and the ability of the European Central Bank to implement effective monetary policies will continue to be hobbled. As Mario Tonveronachi observes in this public policy brief, Europe has a currency union, but this does not mean that Europe has achieved a single financial market, an essential element for a functioning union. He reminds us that a single European market requires pricing in relation to common risk-free assets rather than in relation to a collection of individual idiosyncratic sovereign rates. And financial operators must have access to the same risk-free assets for trading and liquidity operations. The euro provides neither of these functions, and thus, while there has been a measure of convergence, a single financial market, and the financial integration it represents, remains unachieved. What’s New for Industrial Policy in the EU? In this paper, we analyze and try to measure productive and technological asymmetries between central and peripheral economies in the eurozone. We assess the effects such asymmetries would likely bring about on center–periphery divergence/convergence patterns, and derive some implications as to the design of future industrial policy at the European level. We stress that future European Union (EU) industrial policy should be regionally focused and specifically target structural changes in the periphery as the main way to favor center–periphery convergence and avoid the reappearance of past external imbalances. To this end, a wide battery of industrial policy tools should be considered, ranging from subsidies and fiscal incentives to innovative firms, public financing of R & D efforts, sectoral policies, and public procurements for home-produced goods. All in all, future EU industrial policy should be much more interventionist than it currently is, and dispose of much larger funds with respect to the present setting in order to effectively pursue both short-run stabilization and long-run development goals. The crisis in Greece reflects the deep structural problems of the country’s economy, its bureaucratic inefficiency, and a pervasive culture of corruption. But it also reflects the deadly failure of the neoliberal project, which has become institutionalized throughout the European Union’s operational framework—with the International Monetary Fund the world’s single most powerful enforcer of market fundamentalism. 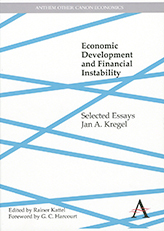 Conventional wisdom suggests that the European debt crisis, which has thus far led to severe adjustment programs crafted by the European Union and the International Monetary Fund in both Greece and Ireland, was caused by fiscal profligacy on the part of peripheral, or noncore, countries in combination with a welfare state model, and that the role of the common currency—the euro—was at best minimal.This paper aims to show that, contrary to conventional wisdom, the crisis in Europe is the result of an imbalance between core and noncore countries that is inherent in the euro economic model. Underpinned by a process of monetary unification and financial deregulation, core eurozone countries pursued export-led growth policies—or, more specifically, “beggar thy neighbor” policies—at the expense of mounting disequilibria and debt accumulation in the periphery. This imbalance became unsustainable, and this unsustainability was a causal factor in the global financial crisis of 2007–08. The paper also maintains that the eurozone could avoid cumulative imbalances by adopting John Maynard Keynes’s notion of the generalized banking principle (a fundamental principle of his clearing union proposal) as a central element of its monetary integration arrangement. With the crisis in the eurozone threatening the integrity of the European Union itself. German Chancellor Angela Merkel continues to brush aside calls to permit the European Central Bank to act as lender of last resort, and she remains steadfast against suggestions for the issuing of a eurobond. Yet Germany does have a plan for the eurozone, even if many prefer not to see it—a plan centered on Darwinian biopolitics and neoliberal economics. The European Union’s survival depends on its ability to reform, either through enlargement—greater economic and fiscal coordination in the direction of some sort of federal state—or by getting smaller, with the eurozone becoming a true optimum currency area. Most analysts support the former proposition. But the rush to strengthen and expand the Union is precisely what led to the current crisis in the eurozone. One of the reasons for the failure of Europe’s governing bodies to resolve the eurozone crisis is resistance to debt buyouts, national guarantees, mutual insurance, and fiscal transfers between member-states. Stuart Holland argues that none of these are necessary to convert a share of national bonds to Union bonds or for net issues of eurobonds—two alternative approaches to the debt crisis that would offset default risk and, by securing the euro as a reserve currency, contribute to more balanced global growth. Debtors’ Crisis or Creditors’ Crisis? Who Pays for the European Sovereign and Subprime Mortgage Losses? In the context of the eurozone’s sovereign debt crisis and the US subprime mortgage crisis, Senior Scholar Jan Kregel looks at the question of how we ought to distribute losses between borrowers and lenders in cases of debt resolution. Kregel tackles a prominent approach to this question that is grounded in an analysis of individual action and behavioral characteristics, an approach that tends toward the conclusion that the borrower should be responsible for making creditors whole. The presumption behind this style of analysis is that the borrower—the purportedly deceitful subprime mortgagee or supposedly profligate Greek—is the cause of the loss, and therefore should bear the entire burden. The trillion-dollar rescue package European leaders aimed at the continent’s growing debt crisis in May might well have been code-named Panacea. Stocks rose throughout the region, but the reprieve was short-lived: markets fell on the realization that the bailout would not improve government finances going forward. The entire rescue plan rests on the assumption that the eurozone’s “problem children” can eventually get their fiscal houses in order. But no rescue plan can address the central problem: that countries with very different economies are yoked to the same currency.